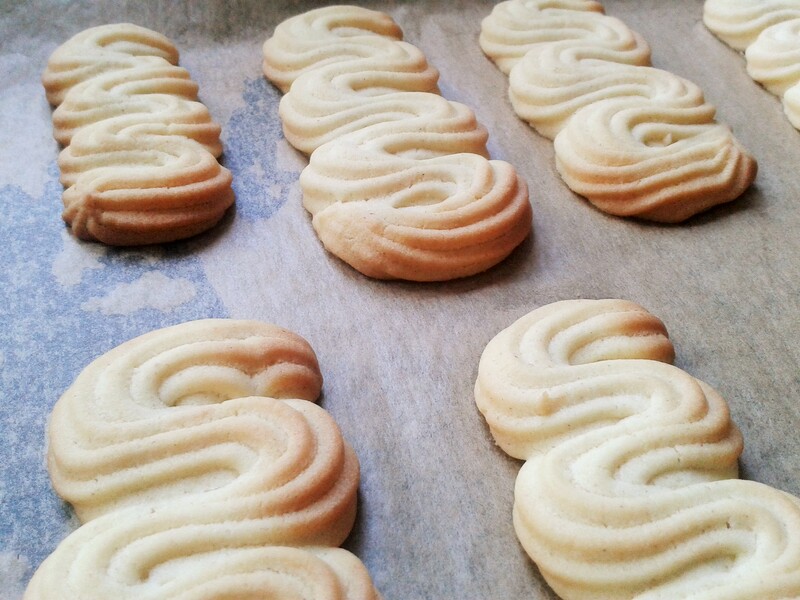 Recipe | Viennese Biscuits – delicate and delicious! Christmas. Someone opens the posh biscuit selection tin. 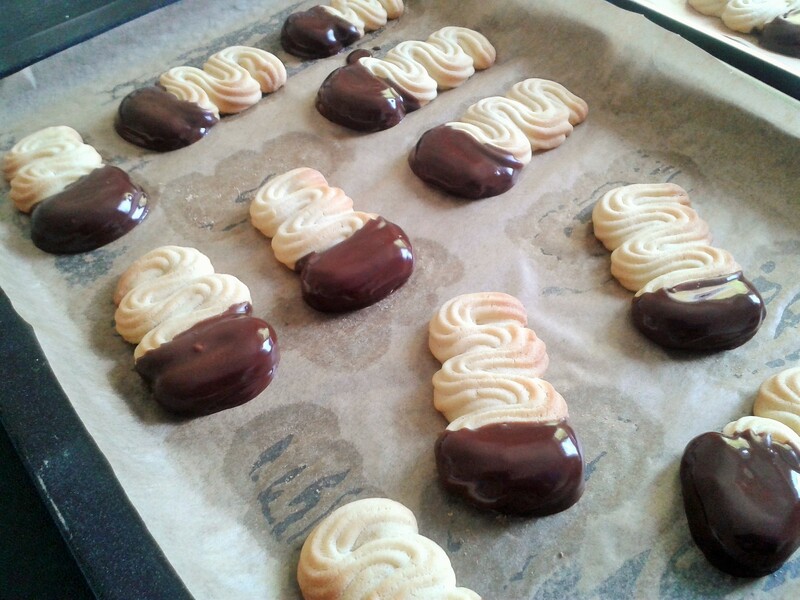 The Viennese fingers always disappear first. That’s because they are melt-in-the-mouth gorgeous. They have a delicate vanilla flavour and crumble easily. I got the recipe from one of my trusty books: Sweet and Savoury bites by Jane Price. I’ve made a couple of small changes to her method – mostly to make things easier and reduce washing up! 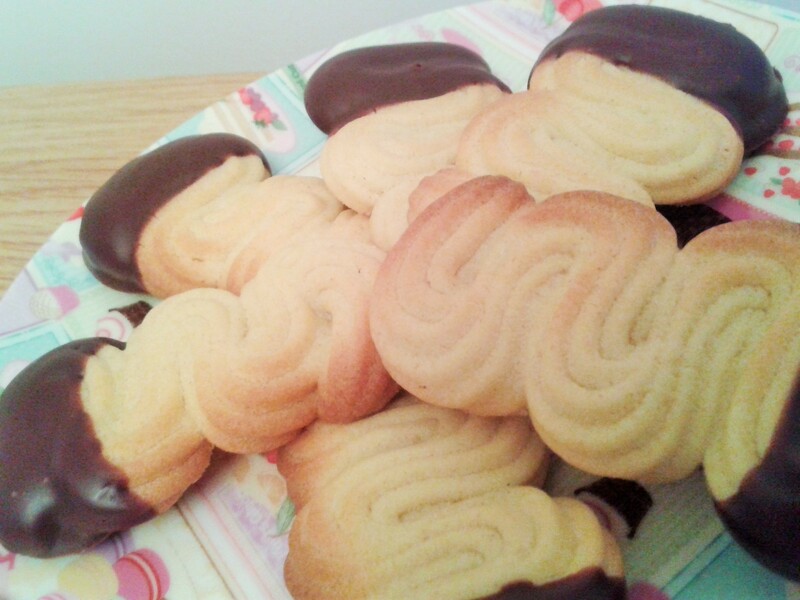 Viennese finger biscuits – delicate and delicious! Preheat your oven to 180 degrees C. Line two baking trays with greaseproof/baking paper. Cream the butter and icing sugar together in a bowl using electric beaters until light and fluffy. Warning! Go really gentle at first or you will have a icing sugar snowstorm to clean up! Gradually add the egg yolks and vanilla and beat thoroughly. Sift the flour into the mixture and use a knife to combine all the ingredients until smooth. Spoon the mixture into a piping bag fitted with a fluted 1cm piping nozzle and pipe the mixture into wavy 6 cm (2.5 inch) lengths on the trays. 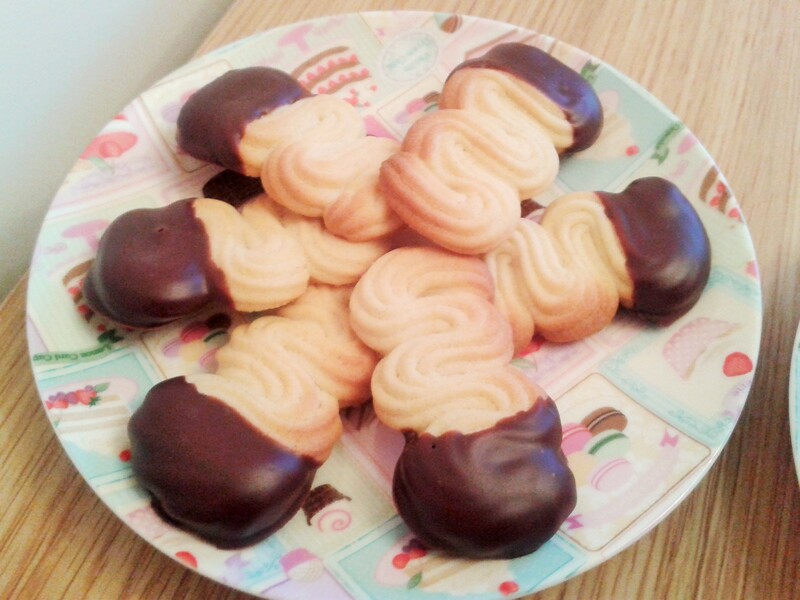 (Well, that’s what the recipe I used said, but I can’t guarantee mine are all a uniform 6 cm!! Just do what you think looks good. Or, if you like a bigger or small biscuit, go with that.). 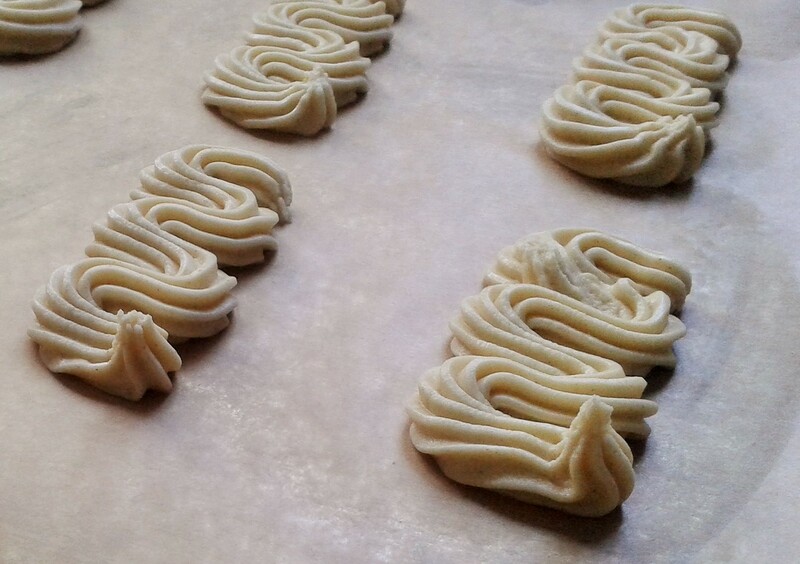 Your biscuits at this point will probably have little sticking up “tails” (see pic to left). Just tap them down with your finger so your biscuits are flat. Bake for 12 minutes or until golden brown. Allow to cool on the trays. Now for the chocolate covering. You can use a bain-marie, but I just use the microwave. Heat the chocolate chunks for 30 seconds in the microwave. Shake. Give them another 30 seconds. Add the butter. Give another 30 seconds. 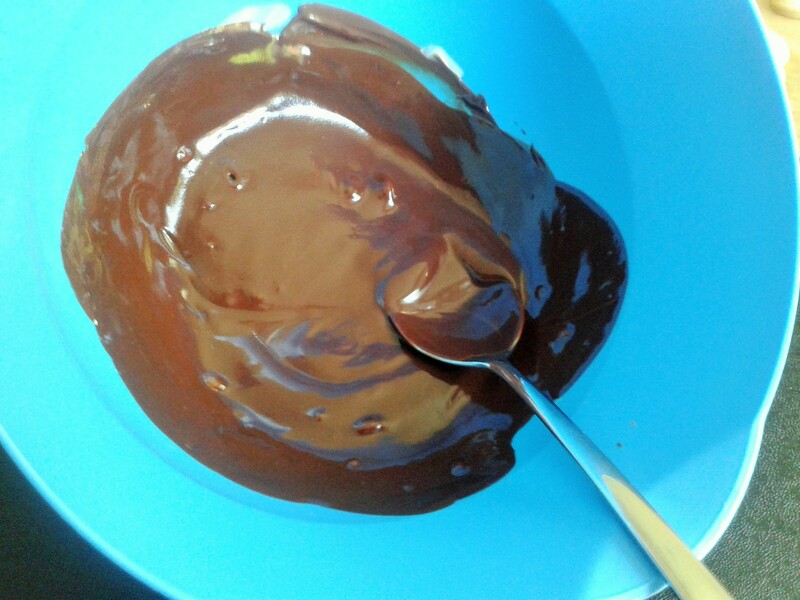 Now stir thoroughly until all the lumps of butter and chocolate have melted and you have a smooth mixture. Dip the end of each biscuit into the melted chocolate mixture and leave to set on the baking trays (which should still have the baking paper on them). Make sure you give them a quick dunk or they tend to break – I lost two this way! Leave the chocolate to set. Enjoy with a cup of tea! 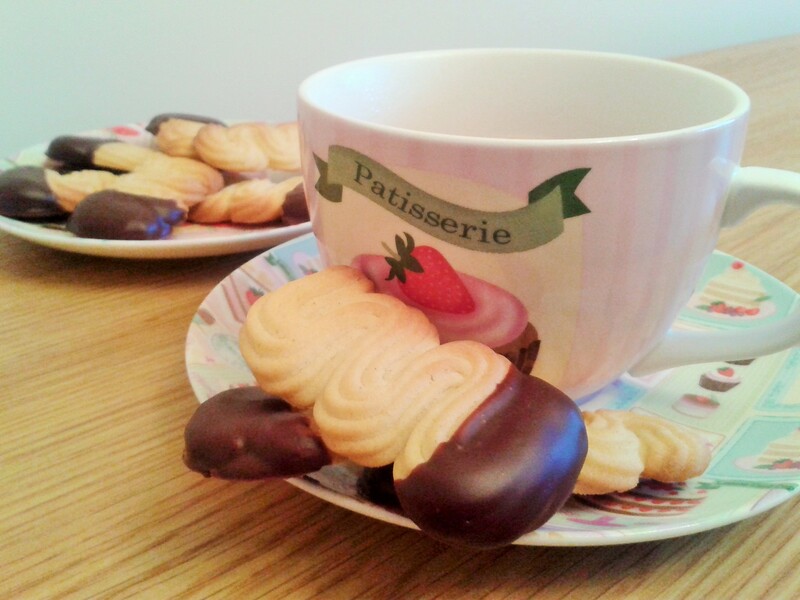 Viennese finger biscuits – ready for tea! This is the first time I’ve made them. As it was surprisingly straightforward and they came out so well, I’m sure I’ll be making them again. My grandmother used to make these when I was little! I’m definitely going to try out this recipe, these look delicious!